Si Mi Mamá Fuera Un Ornitorrinco: Los Bebés Mamíferos Y Sus Madres (Paperback) | River Dog Book Co. The animal kingdom offers a special fascination for children because so many of the cozy rituals they share at home are echoed in nature. All mammal mothers feed, protect, and teach their young--tasks that often challenge their own needs for survival. With beautiful illustrations and inventive text, this fascinating introduction--now in Spanish--reveals how fourteen mammals' babies travel the path from helpless infant to self-sufficient adults.Por todo el mundo, en todo tipo de h bitats, las madres traen nueva vida. Para muchos animales, tales como los reptiles y anfibios, las responsabilidades de maternidad terminan aun antes de que los beb's nazcan. Pero las cr as de los mam feros necesitan a sus madres--necesitan ser amamantadas y nutridas por suficiente tiempo para aprender a sobrevivir por su cuenta. Todas las madres de mam feros alimentan, protegen y educan a sus cr as, aunque estas tareas a menudo desaf an sus propias necesidades de supervivencia. Pero el camino de un beb mam fero a la madurez var a enormemente seg n se trate de un oso o un murci lago, una musara a o una foca, un hipop tamo o un humano. Esta introducci n fascinante al mundo de los mam feros revela c mo catorce mam feros beb's recorren el camino de ni os indefensos a adultos autosuficientes. 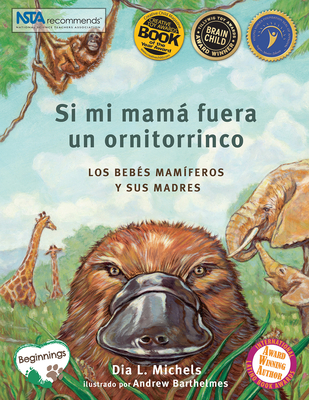 Si mi mam fuese un ornitorrinco is also available in English as If My Mom were a Platypus. The book also comes in Dutch and Hebrew editions. Dia L. Michels is an award-winning internationally published science and parenting writer, she is the author or editor of over a dozen books for both children and adults. Her books have been translated into Spanish, Dutch, Hebrew, Chinese, and Korean. A popular speaker, she lectures frequently at conferences, universities, libraries, and schools around the country. She teaches classes on mammal reproduction and lactation at children's and science museums around the U.S. and is a commentator for Public Radio, International. Her articles have been published in People, Parenting, Mothering, Parents, Baby Talk, Family Fun, Nurturing, and the Washington Post. She lives in the Capitol Hill neighborhood of Washington, DC, with her husband, Tony Gualtieri, their three children, and four cats and a dog. Andrew Barthelmes, illustrator of If My Mom Were a Platypus, and designer of I Was Born to Be a Brother and many other projects, is a New York based illustrator and graphic designer. A graduate of The School of Visual Arts, his illustrations have appeared in publications such as The New Yorker, Ladies' Home Journal, Street & Smith's Sports, and The Wall Street Journal. In addition to the Platypus book, he also illustrated Herman the Loudmouth. He has been a children's book designer for Random House, Inc. and is currently creating new children's books for Reader's Digest. He lives in Peekskill, NY with his wife Barbara, and new baby, Julia.